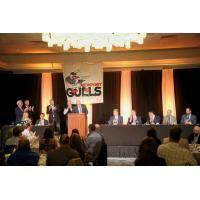 Newport, R.I. - Seven members of the Newport Gulls family - five players and two long-time volunteers - joined 22 others in the team's Hall of Fame during an extraordinary event held at Gurney's Newport Resort on Saturday, Feb. 2. The organization, entering its 19th year of operation in the City-by-the-Sea, celebrated the remarkable accomplishments of the Hall of Fame's Fifth Class in the Induction Ceremony, the team's first since October 2016. The five-player inductees included 2003-2004 Outfielder Ryan Chambers (Brigham-Young), 2005-2006 right-handed pitcher Paul Nardozzi (Pittsburgh), 2009 right-handed pitcher Andrew Kittredge (Washington), 2011-2012 right-handed pitcher Daniel Wright (Arkansas State), and 2011-2012 catcher Jeff Melillo (Rutgers). Director of Public and Community Relations from 2001-2016 Kristine Hendrickson, and Robert Capodilupo, Gulls On-Field Master of Ceremonies during the 2005-2010 seasons, rounded out the induction class honored at the event. Over 260 current and former players, volunteers, interns, host families, sponsors, family, friends, and fans were on hand for the event, which doubled as a silent auction benefiting the team's operations, which include the Newport Gulls College and Summer Camp Scholarship Fund, People's Credit Union FANatic About Reading Program, Health and Wellness Program, and additional charitable giving that the Gulls, a 501(c)(3) non-profit, regularly undertake. Among those in attendance were the City of Newport's new mayor, Jamie Bova, and state Rep. Marvin Abney, Chair of the House Committee on Finance. Representatives from other NECBL member organizations, including the Keene Swamp Bats (Keene, N.H.), Ocean State Waves (Wakefield, R.I.), and the league's newest team, the Martha's Vineyard Sharks (Martha's Vineyard, Mass. ), as well as the league's President, John Derosa, joined in the festivities. Also on-hand to support their fellow Hall of Famers were previous inductees, Michel Bergeron (Brigham- Young University), Mike Melillo (Elon University), Rick McGowan (Newport Daily News), and Don O'Hanley (Gulls Public Address Announcer). Bergeron and Ryan Chambers were teammates at BYU but did not spend time together in Newport. Bergeron, a right-handed pitcher, was a member of the inaugural Newport Gulls roster, as well as the franchise's first Hall of Fame Class. He won New England League Championships in both the 2001 and 2002 seasons. Melillo, brother of Jeff Melillo, was also a standout catcher for the Newport Gulls. He was inducted into the Hall of Fame with the Fourth Class and was a Gull in 2008-2009. McGowan covered the Gulls for the Newport Daily News from 2001 until his retirement in 2011 and was a member of the Second Hall of Fame Class while O'Hanley was inducted alongside the Third Class in 2014 and still serves as the Gulls Public Address Announcer at Cardines Field. The completion of this truly remarkable event means that the Newport Gulls 2019 season and the team's chase for a seventh NECBL championship is right around the corner. The Newport Gulls thank all of the individuals who came to support the organization, as well as all sponsors and silent auction donors. Stay tuned for the release of the 2019 Schedule and 2019 Roster - there just might be some future Gulls Hall of Famers coming to Newport this summer!